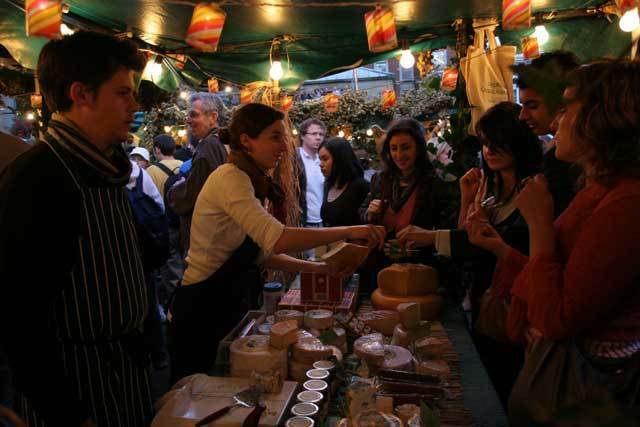 From the 12th to the 23rd of December, Covent Garden will host The 12 Days of Christmas Luxury Food Market as part of their greater Christmas Deluxe event. The market will showcase seasonal and festive British edibles, such as plum and fig puddings, mince pies, organic seasonal vegetables and fruits, smoked fish, oysters, Neal’s Yard Stilton, pork and cranberry pies from Ginger Pig, spiced cider … and (as word has it) lightly seared partridge in a pear tree wrapped in bacon. Tis the season to eat luxuriously? Hey, why not? It’s a great opportunity to limber up that tummy for the big feasts fast approaching. Besides, when not gorging yourself on roast beast, you can admire pretty Christmas decorations and lights and maybe even get control of all that last minute gift shopping left to do.